Akershus Royal Banquet Hall is located in the Norway pavilion at Epcot Center. Its setup is unique in that the meal encompasses an appetizer buffet, individual entrée and family-style dessert. The main draw is of course the princesses that grace you with their enchanting presence during the meal. 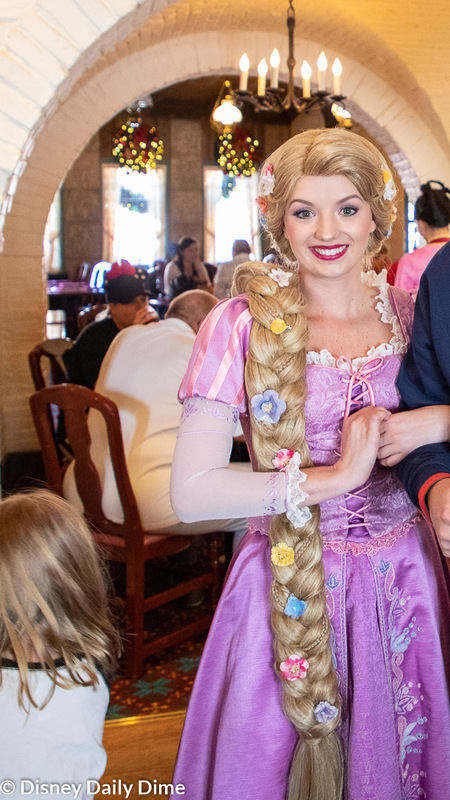 Belle is the host princess, while Ariel, Snow White, Cinderella and Aurora typically visit each table in the dining room. If you have read our Cinderella’s Royal Table lunch review or our character guides, we point out that Disney always puts a disclaimer that “character appearances and entertainment are subject to change.“ As you will read below, we finally experienced when that disclaimer applies as we didn’t have the “usual” princess rotation this day. Akershus opened with the Norway Pavilion in 1988. The restaurant has made two notable changes since it’s opening almost 30 years ago (gulp – I vividly remember it opening so that makes me feel very old!!!). The first change came with the introduction of the princesses. Granted, back in the late 80s princess popularity wasn’t like it is today. Second, the meal was entirely a buffet with both cold and hot items. It was also more “Norwegian” than it is today. The fare was much more authentic and less scaled back. My parents and I absolutely fell in love with Akershus and dined there every chance we could in the late 80s and early 90s. 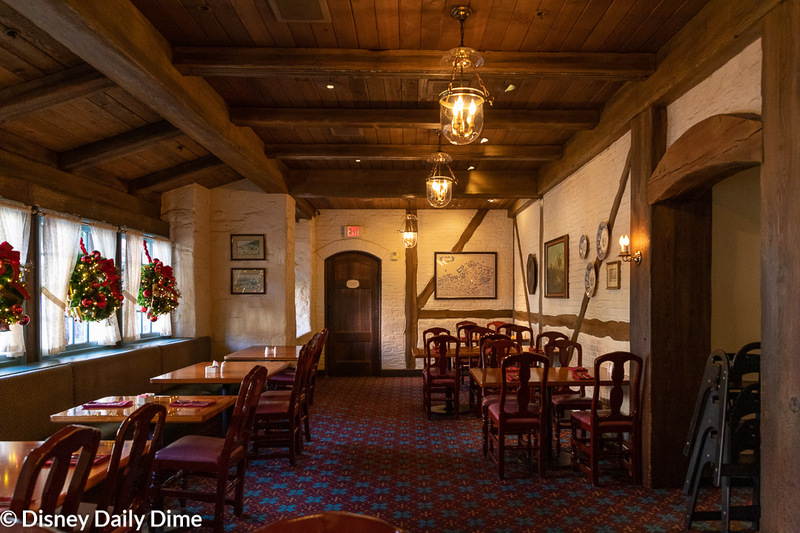 While we collectively miss the Akershus of old, my parents and I all agree this is still one of our favorite Disney restaurants to experience. 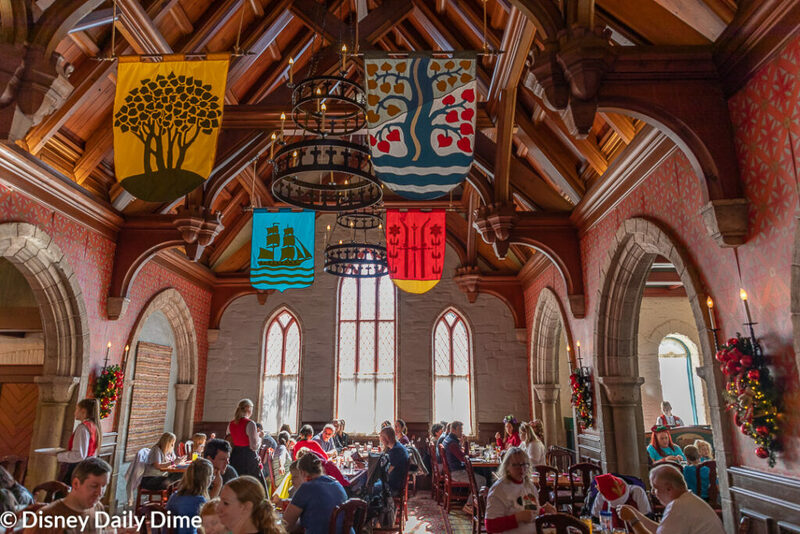 Akershus will run you one table service credit on the Disney Dining plan. This is an excellent use of a dining plan credit for two reasons. First, Cinderella’s Royal Table costs two credits for a similar princess experience. Granted, you aren’t in “the Castle” like you are at Cinderella’s, but Akershus is very much a regal castle experience. Second, the out of pocket is around $60/adult and $30/child. From a monetary perspective, that is some of the best value you can find for a dining plan credit. Akershus is inspired by the Akershus Fortress in Oslo, Norway. The inside is straight out of fairytale or movie version of a castle with high ceilings, stone work, arches, banners – all the appropriate Castle décor. The restaurant is dividend into different dining rooms. On this day, we were seated in the dining area closest to the buffet which was fine, but there was definitely a considerable amount of foot traffic at this table. But given this is a character meal, there is always “traffic” and hustle and bustle so this room didn’t feel that much more congested than any other areas. The princesses will lead the kids in a “princess procession” through the restaurant at various times if your kids wish to participate. All of the servers and hosts we have ever had are from Norway. We have always had wonderful conversations with them as they are always willing and excited to speak about their home country. Service has always been excellent: friendly, attentive and timely. Our server this day, Orjan, was excellent in handling our large party of 10. He answered any and all questions about the food, facilitated my gluten-free needs and other special requests with ease and was patient and helpful with the four girls in our group. He even taught us all about the Norwegian alphabet and how it has extra letters compared to our American alphabet. Warning: after you hear the song playing throughout the restaurant it may get stuck in your head. Belle is the host princess, so like Cinderella at Cinderella’s Royal Table she greets everyone in an alcove near the entryway. 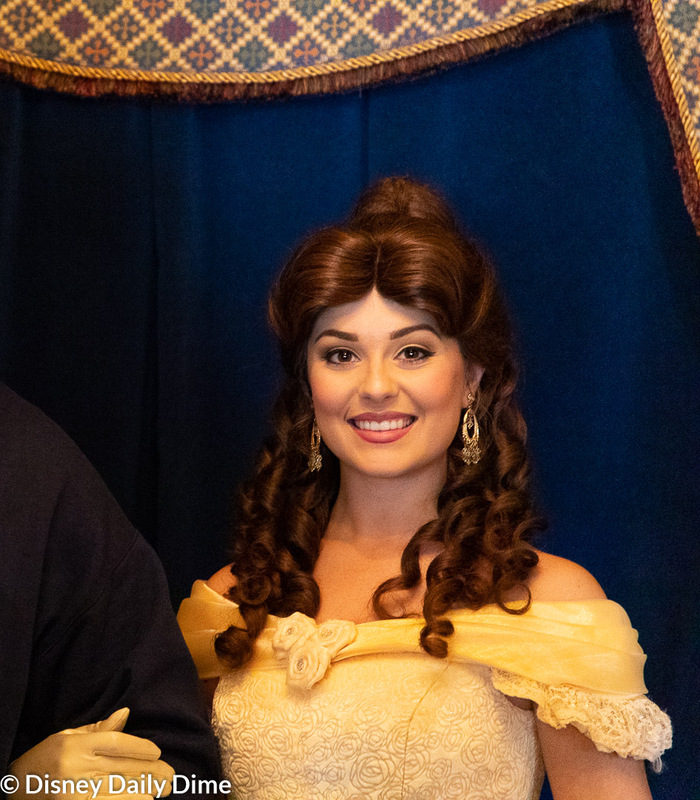 A photopass photographer is on hand for your time with Belle, but note that you will have to use your own camera to get pictures with the princesses as they visit your table. The typical rotation as noted earlier is Cinderella, Aurora, Ariel and Snow White. However, during our dining time, we had some “surprise” princesses visiting the castle. While Cinderella and Aurora were there as usual, Mulan and Rapuzel were visiting the Akershus Royal Banquet Hall at this time. We enjoyed our interactions with them just as much. Elsa in particular is a huge Rapunzel fan so this was a wonderful surprise for her. Our Ariel-loving Anna was supremely disappointed though. Because of this it is always wise to either 1) not tell your princess loving little ones that a particular princess will be at a princess character meal or 2) explain that they may not be there beforehand. Fortunately, all of the princesses can be met somewhere else on Disney property. 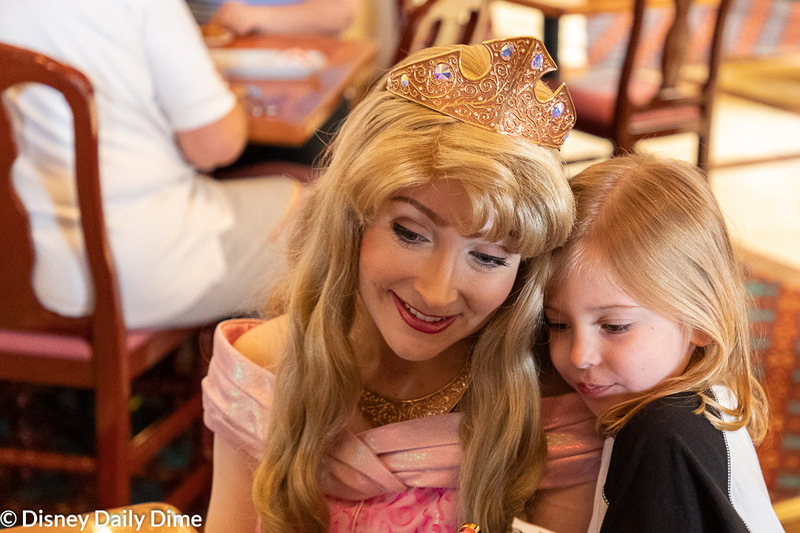 If possible, in your trip planning don’t set a princess meal at the end of the trip if your little one is absolutely counting on meeting someone in particular. It is good to know where a princess also meets (see our character guides for assistance with this!) so you can build in a “back up plan” if the beloved princess isn’t at your meal. For example, we promised Anna we would visit Mermaid Ariel at the Magic Kingdom when we were there later in the trip. As always, the princesses are very sweet, engaging and gracious. We did not feel rushed with them at all and they took the time to sign autographs and take many pictures with us. On this day, our dining party was made up of the four of us, my parents, and our close family friends. We had six adults and four kids so we will have a variety of food and experiences to discuss. 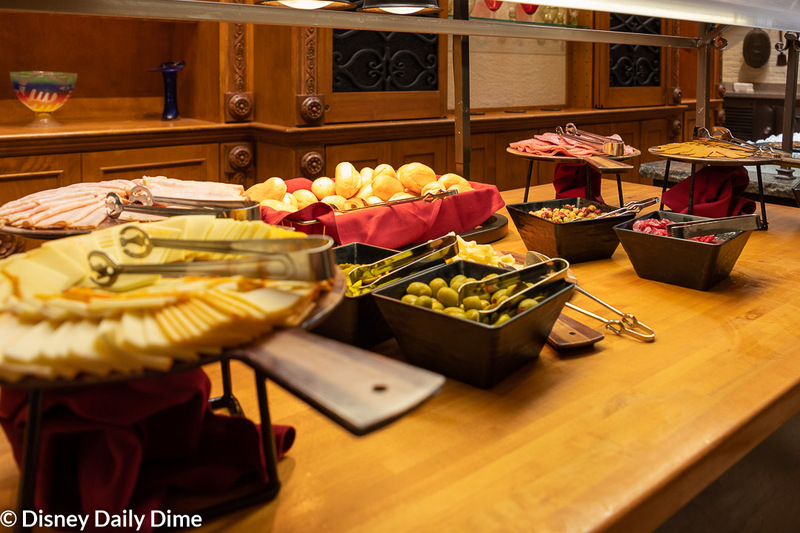 The appetizer buffet at Akershus Royal Banquet Hall is called “A Taste of Norway” which is an appropriate name. It is a cold appetizer buffet offering a variety of salads, fruit, sliced meats, cheeses and seafood. It is all you care to enjoy and you can make as many trips as you want. 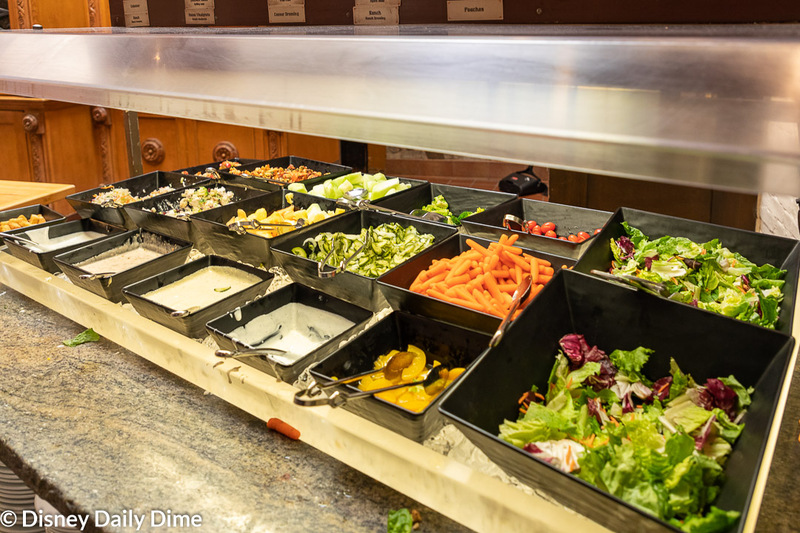 You’ll find it kid friendly with a traditional salad bar and fruit and cheese selections. However, many of the mixed salads like the macaroni salad and shrimp salad may also appeal to them. Our dining party had a variety of the items and everyone noted that they enjoyed the offerings. The appetizer bar caters to the more adventurous eaters who are eager to try some Norwegian specialties while also offering plenty of variety for those who want to stick to familiar foods and flavors. It provides light and refreshing fare that creates a great balance with the heavier hot entrees. As part of the meal, everyone chooses an individual hot entrée. Our group chose a few different ones off the menu. 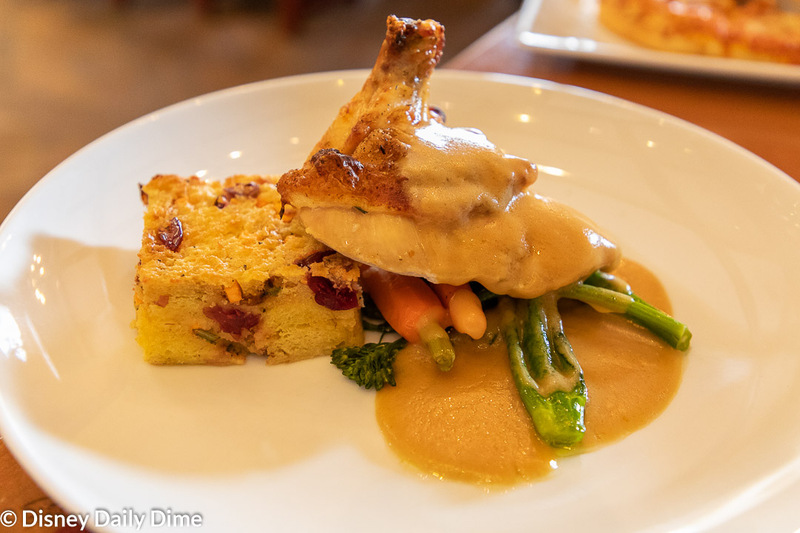 The Kyllingbryst – Herb Roasted Chicken is served with a sweet potato and cranberry bread pudding, seasonal vegetables and Gjetost pan gravy. Everyone who had this enjoyed the chicken which was cooked perfectly and well-seasoned. The bread pudding was a bit polarizing as some enjoyed it while others did not. 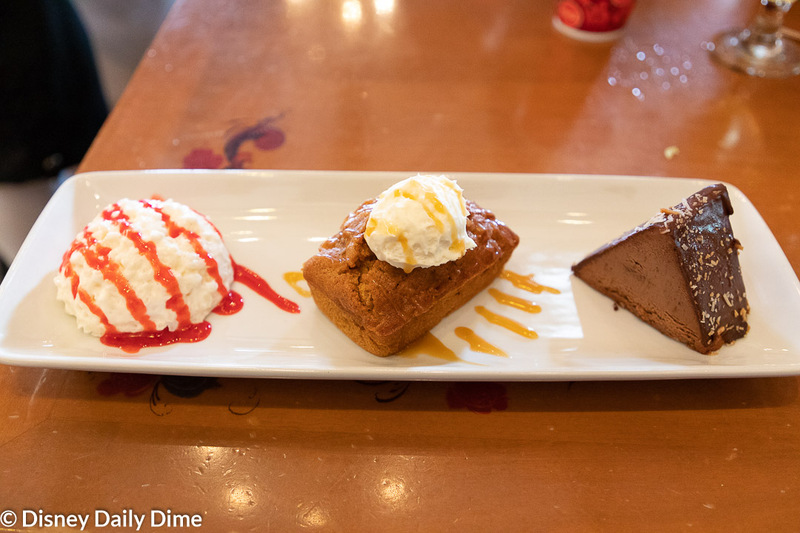 The combo of sweet and savory flavors brought Thanksgiving to mind. 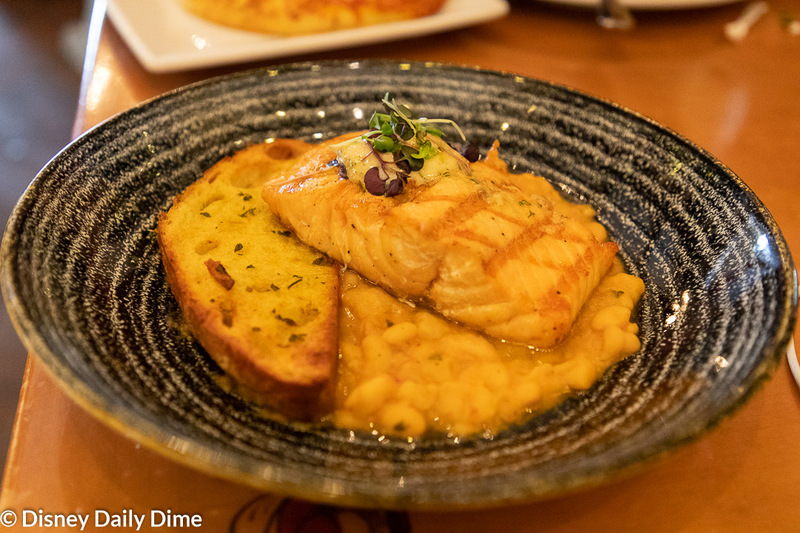 The Laks – Grilled Fillet of Salmon is served with a ragout of white beans and bacon, garlic crostini and citrus-smoked salmon butter. The portion was generous and like the chicken, was flavorful and cooked to perfection. One of our friends made a request to have it without the bacon which our server accommodated happily and with no issues. 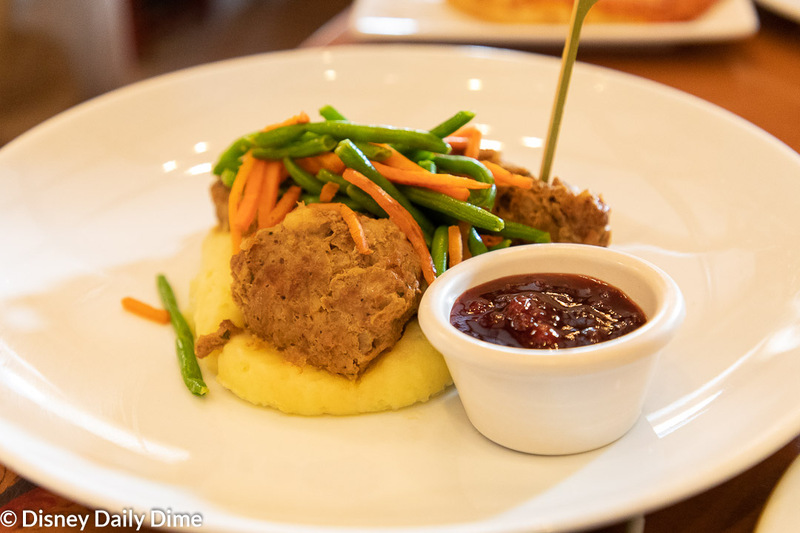 I chose the gluten-friendly Norwegian meatballs served with lingonberry sauce, olive oil mashed potatoes and seasonal vegetables (I received green beans). The meatballs were delicious, especially with the lingonberry sauce providing a slightly sweet note to balance the flavors of the meatball. 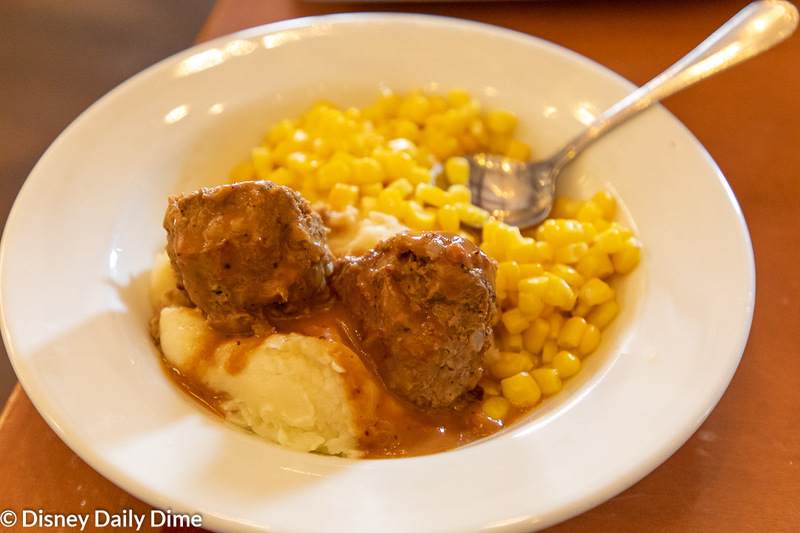 I loved choosing an entrée that had Norwegian roots to add to the authenticity of the meal. The Viking Mixed Grill offers a tasting portion of three different items and is a great option if you have a hard choosing one entrée. 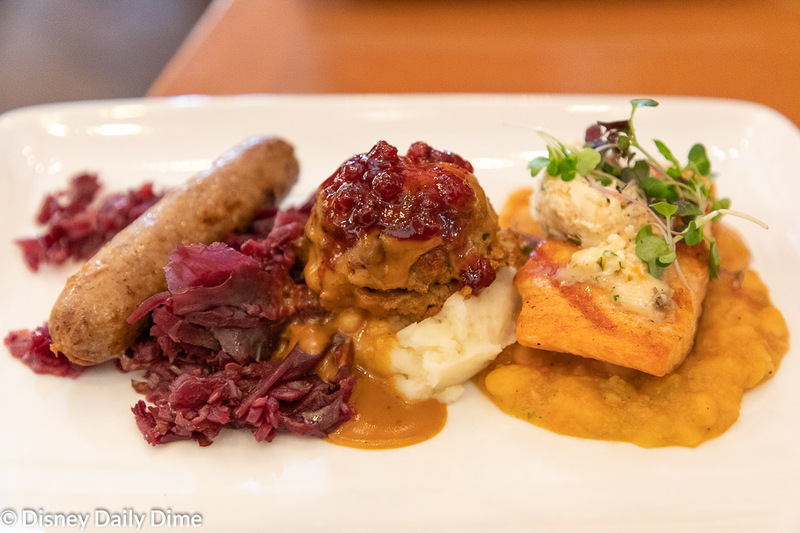 The mixed grill includes the filet of salmon, Norwegian meatballs and grilled Vossakorv sausage. The four girls chose either the cheese pizza or the kids portion of the Norwegian meatballs. 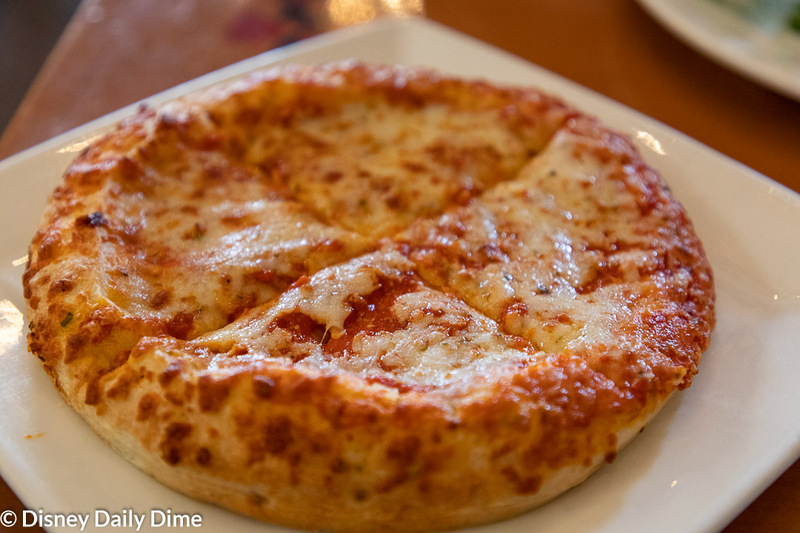 The pizza was the typical pillowy crust Disney pizza. Elsa was one who chose the meatballs and she really enjoyed them. They were served with mashed potatoes and corn. She has never been a fan of mashed potatoes so she ate around those but she told us she liked the corn. The desserts are served family style as part of the Royal Chef’s Dessert Plate. The servers will bring more of any or all that the items that you request. The Rice Cream is topped with a delicious strawberry glaze. This seemed to be a love-it-or-hate-it dessert. Those of us that liked it really enjoyed it but the few that didn’t couldn’t get past the texture. The cake was an apple cake with delicious cinnamon and spice notes. It was topped with whipped cream and a caramel drizzle. This was well liked at our table and seconds of this dessert were ordered. Finally, the chocolate dessert was a rich and creamy chocolate mousse surrounded by a layer of dark chocolate. This was a big hit with the girls especially and seconds of this were also ordered for the table. I will discuss this more in my gluten free dining review but I was able to enjoy my own generous serving of the rice cream, which is gluten friendly. Our server noted that the strawberry topping was not safe so he offered to bring me a bowl of strawberries. This went above and beyond in my opinion and I greatly appreciated his thoughtful gesture and the generous bowl of fresh strawberries he brought out. 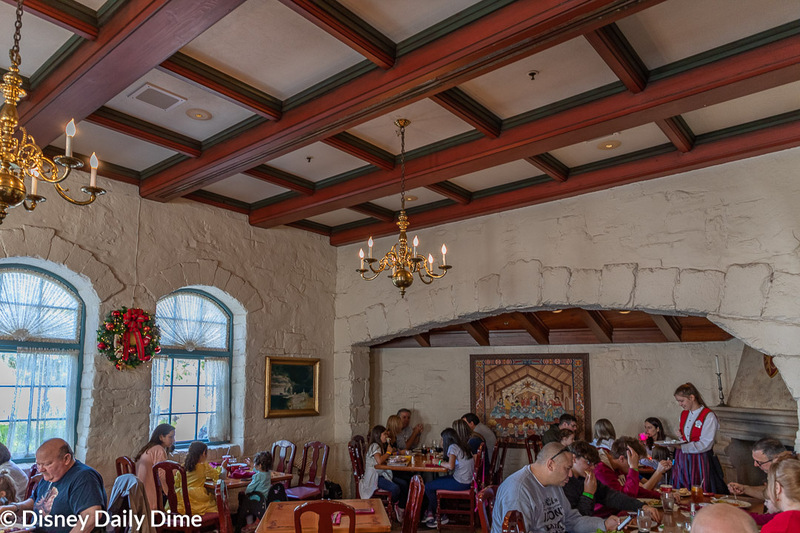 I know that I am looking it at with a bit of nostalgia but Akershus is always at the top of my favorite Epcot restaurants to visit. The food is top notch, the atmosphere is fun, the service is excellent and the princesses are a fun bonus. 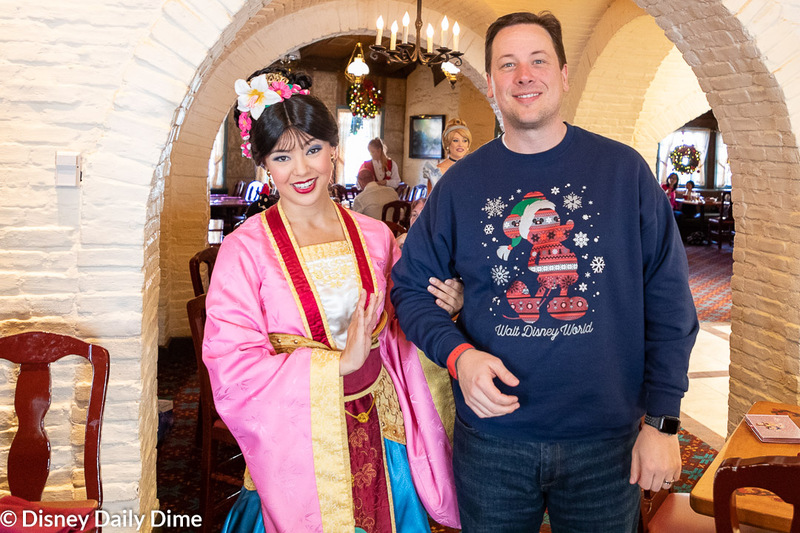 We think it is obvious that several of the character meals around Disney World property put more emphasis on the characters and less on the food itself. Akershus is an exceptions to this, where the food stands on its own for its quality and variety. In a vacuum, we would recommend this over Cinderella’s Royal Table (the other popular princess meal) based on the food quality and the value. While you don’t get to dine in Cinderella Castle, we don’t see that being worth the incremental money. If you want an even more economical princess dining experience, you can try the Bon Voyage Adventure Breakfast over at the BoardWalk Inn. While not the same experience as Akershus or Cinderella’s Royal Table, it’s still a great option. With that, we’ll wrap up our Akershus Royal Banquet Hall review. 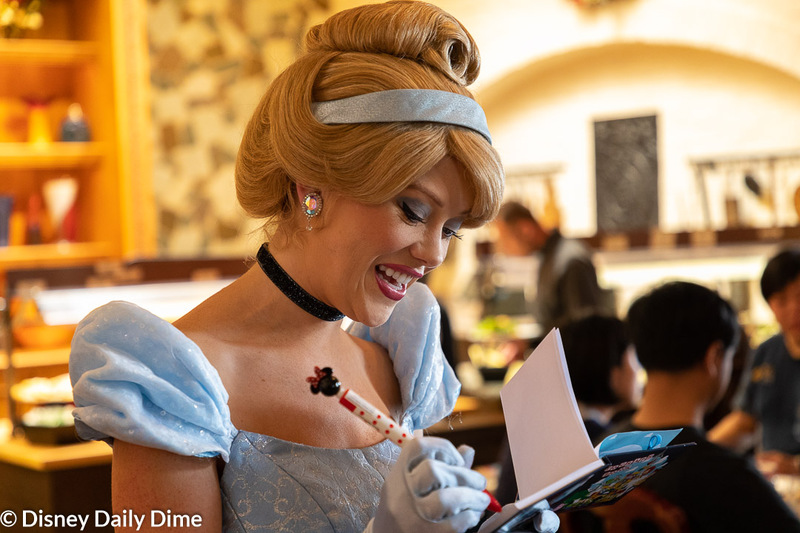 Here you will find a character meal that is truly more than just about the princesses that visit the tables. If our Akershus Royal Banquet Hall review was helpful, or at least entertaining, please like and share this with your friends or anyone you think will find it useful. Just use the sharing buttons on the page. We always appreciate it when you share our posts, as it allows us to spread the word about our young blog and hopefully allows us to help others.